A simple dress can be an end in itself. 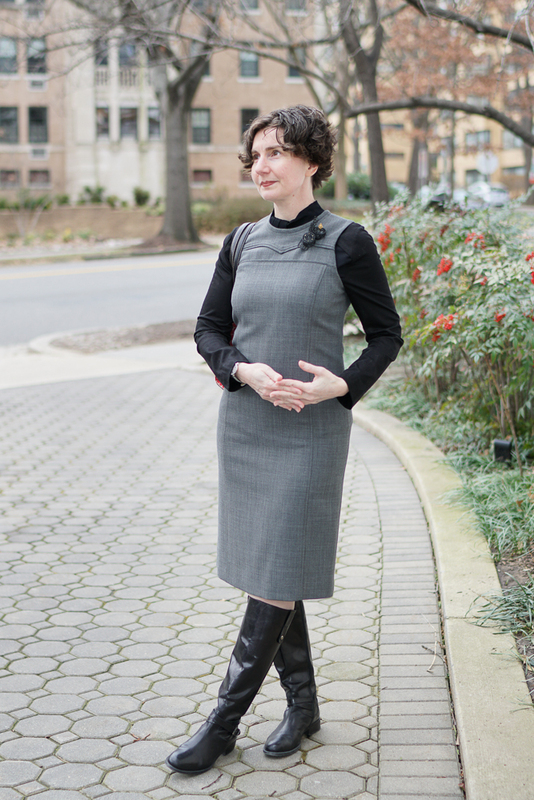 Even better, simplicity often yields versatility, which allows the simple dress to play many roles. 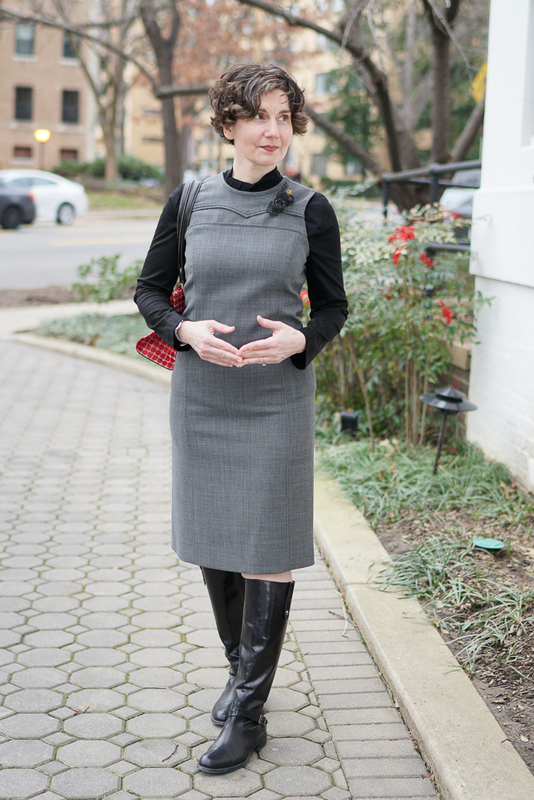 I’ve had this grey wool sheath for years; it was first (and I believe last) seen on this blog with a grey wrap sweater and a multistrand gold necklace. Very Effective, I believe, in the role of Foil. But today, it’s been asked to serve a different role: Sponsor. Is this misdirection? What is this post about? But first, before we discuss the brooch, let’s take note of the blouse. 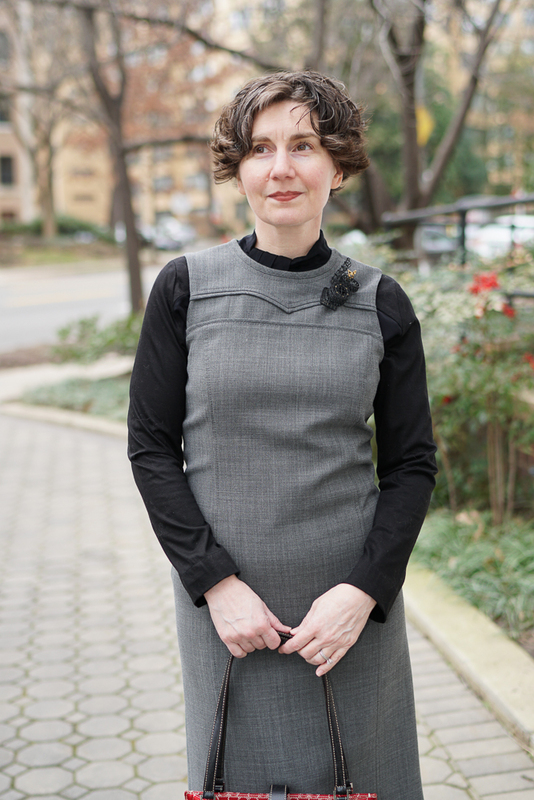 The blouse may not register as much in these photos, but it’s a smart layering piece made of an elegant, matte-finish silk jersey. The neckline is a wrapped, key-hole design which, at rest, looks like a turtleneck (or mock-turtleneck). For those who find YOOX impenetrable, you may want to dip a toe in the water by searching periodically for garments like this — smart, simple blouses in quality fabrics. 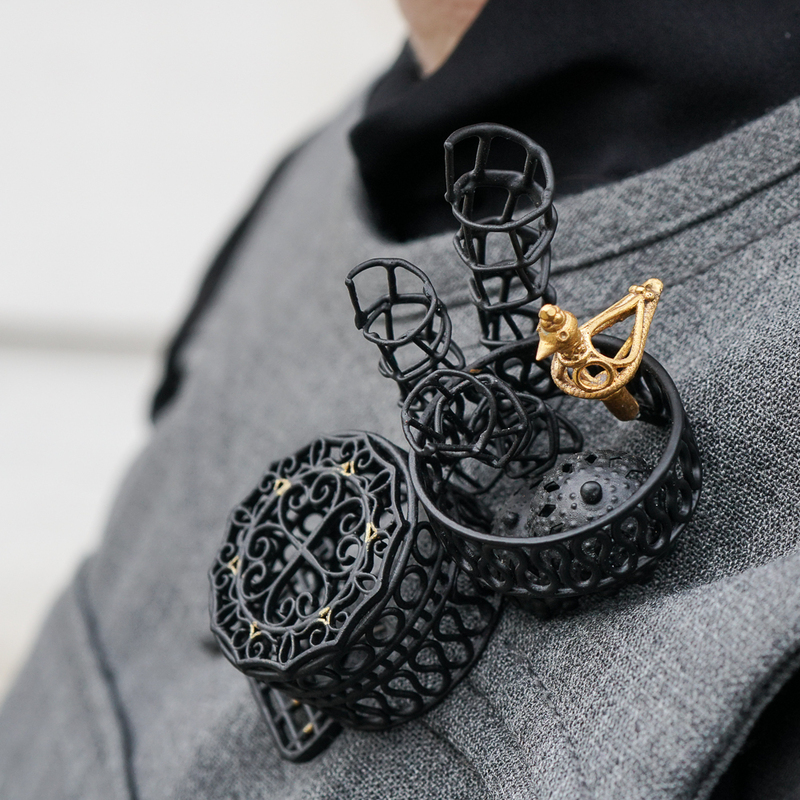 Limit your search to a color (black), style (long sleeves), material (silk and/or wool), and time (15 minutes) Note: The time limit is self-imposed; YOOX provides no such filter and would be delighted to have you visit all day. 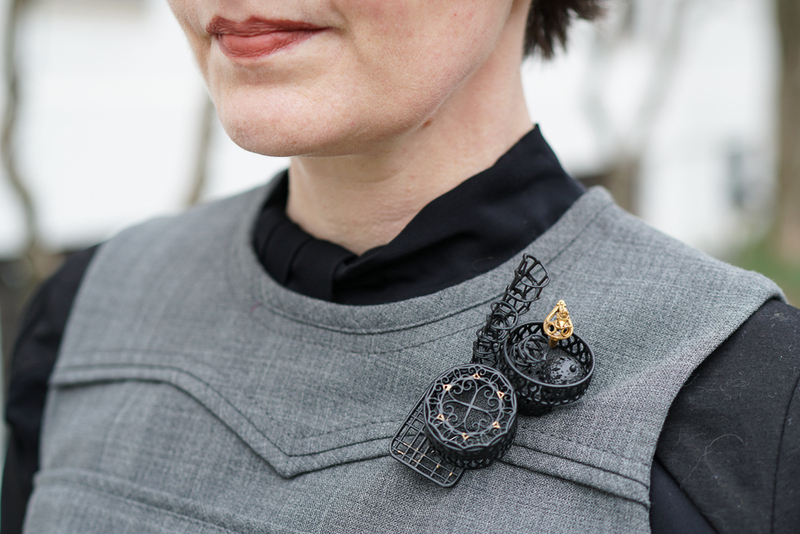 As much as I loved the form, intricacy, and implied action of this brooch, I was a little concerned about the color — black — and wondered if it might simple fade into the neutrals (including black) that I often wear. You might not guess it, but the brooch is feather-light. It weighs only 26 grams, which is an easily managed weight to pin on any jacket, winter dresses, and extra-thick sweaters. For those who are wondering what 26 g feels like, I’ve written on this topic, as it relates to brooches, previously. This brooch came from Galerie Noel Guyomarc’h in Montreal. 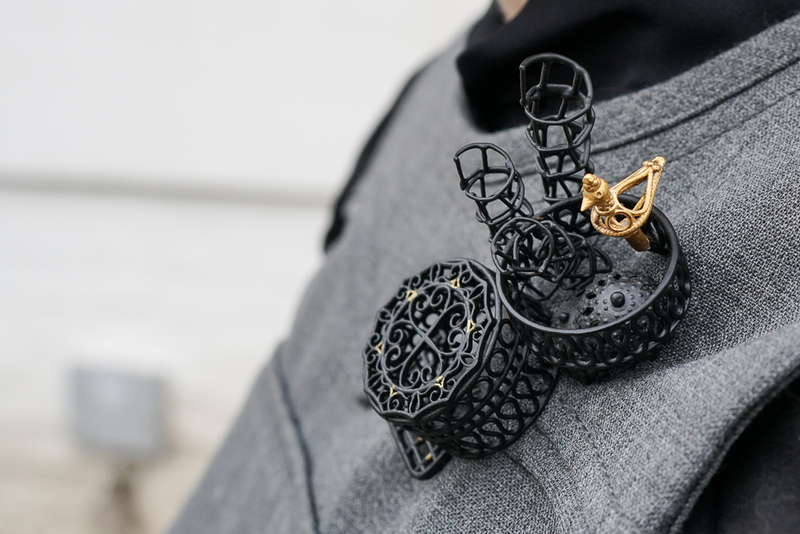 I selected it from a photo on the gallery’s website and believed that the little gold charm ornamenting the black fretwork was a miniature Eiffel Tower. But if you look closely, you will see that it is not. It’s something better. A duck! Can you imagine my delight? Some may read this as a cautionary tale, but I think it’s an inspirational story. Another tip for buying a brooch unseen via the Internet: Get the dimensions as well as the weight. Make a paper cut-out using the dimensions and tape it to a jacket or dress to see whether it is too big, too small, or just right. You may be surprised when those dimensions make the jump from the written page to the material world. Is it just me or has the Directrice been posting more frequently lately? Either way these posts are a source of delight in what for many of us is a dark time of year and point in time. The posts must take much effort and time, both hard to come by for a busy woman with a challenging career. So, a deep thank you for the joy you bring us, as beautifully evident in the whimsey of the Eiffel Duck! Rhizophora — You are so sweet. I don’t think I am posting more . . . but sometimes I post a day early (Sunday night or Wednesday night) because I am anxious to share what I think is an unusually good post! Comments like yours and those from other readers are my motivation. It would be very lonely to make the effort and then hear nothing, so I am always so pleased when people share their reactions, experiences, and ideas! Rhizophora put it beautifully. The joy is shared and this piece Is beautiful, interesting, and surely something that is one of a kind I might never have seen. The surprise you received in viewing it first time is amusing since it so often happens when I order things. In this case it’s a lovely surprise. A practical question for our ingenious hostess and the assembled wisdom: What’s the word on wearing broaches and necklaces at the same time? Obviously not big statement-y necklaces, but maybe a pendant that falls between a statement and a plain chain? You ask an interesting question, Ellie. I tend to think that a necklace and brooch should not be worn together unless one is aiming for a maximalist look of a bunch of layered gold chains and pendants with a glitzy brooch -/ which would be fun and chic. But I am interested to hear others’ views and will present your question in my next post. Feel free to send me a photo of your idea c/o Harper’s address. That is my instinct, too. As Michael Kors reminded us periodically, outfits should show off cleavage or legs, but not both. Seems like the same would apply to jewelry. But I put on a big bead necklace the other day and then suddenly felt sad that adding a broach felt wrong. May be a project to play around with this weekend, and see if there is anything that works. Will share any surprisingly functional ideas and/or entertaining disasters… And look forward to others’ thoughts. Love the originality of this piece!